U.S. President Donald Trump has caused controversy after he retweeted three inflammatory anti-Muslim videos from a British far-right group. 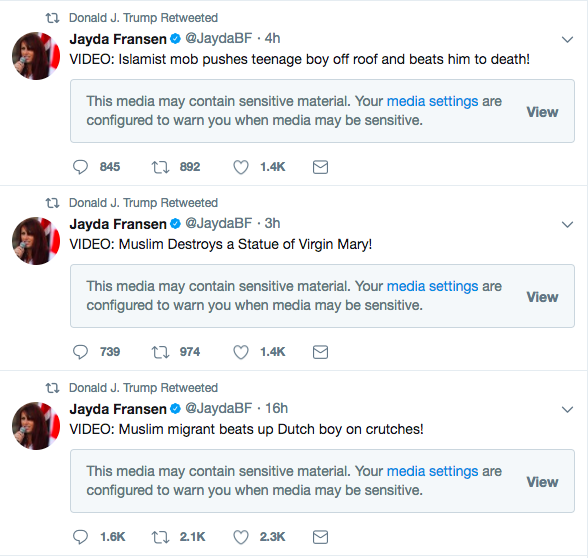 Donald Trump has retweeted three videos from Jayda Fransen, the deputy leader of the Britain first movement, a nationalist, anti-Islamist political party in the UK. The first retweet was a video titled, "Muslim migrant beating up a Dutch boy on crutches," while the second, "Muslim Destroys a Statue of Virgin Mary!," and the third and most gruesome, "Islamist mob pushes teenage boy off roof and beats him to death!" The videos were retweeted without comment. All of the clips are unverified and Fransen has been called out several times for stirring anti-Muslim sentiment by misrepresenting the providence of videos. Clearly missing the irony, Trump followed up his three retweets by tweeting about “fake news CNN”. Britain First was founded in 2011 by former members of the far-right British National Party (BNP), and has grabbed attention on social media with controversial posts about what they deem "the Islamification of the UK". Islamophobia is just one of a number of controversial views that have been promoted by Fransen. Britain First has also called for the restoration of public hanging as a punishment, and members have given their support to religious war in the UK. Even Paul Joseph Watson, Infowars editor-at-large and a leading right-wing internet commentator based in the UK, suggested the move was "not great optics". Yeah, someone might want to tell whoever is running Trump's Twitter account this morning that retweeting Britain First is not great optics. ???? British journalist and television personality Piers Morgan also stepped in to call out Trump on the dangerous faux-pas. Donald Trump has previously been criticised for converying anti-Islamic sentiment, after he signed an executive order halting all refugee admissions and temporarily barring people from seven Muslim-majority countries.